Organized in the 1970’s, the South Arkansas Historical Preservation Society, Inc., formerly known as the South Arkansas Historical Foundation, Inc., has been dedicated to educating the public about Arkansas’ rich history for over 30 years. Its most important project has been the restoration and preservation of the Newton House Museum. External restoration work was completed in 1983 and the interior was completed a few years later. Ongoing tours allow the public a glimpse into life in 19th century Arkansas. With the Newton House Museum as its focal point and with the recent addition of 1,100 sq ft of exhibition space in our administrative building, this not-for-profit organization continues to promote the study of the history of southern Arkansas, Union County, and El Dorado. 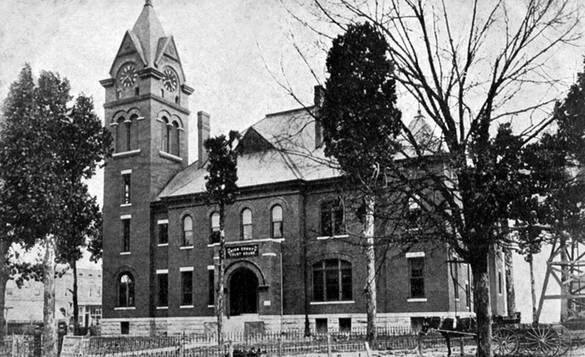 This Union County Courthouse was built in 1881. The brick courthouse with clock tower was replaced with the current Classical Revival style courthouse at the same location in 1928 when the oil boom created an influx of capital for the area. The Preservation Society was created in 2009 to act as the Friends support organization for the SAHPS and its activities. Membership in the society supports the preservation of the Newton House Museum and the educational programs regularly offered under the society's banner. Recent educational programs have included lectures on the De Soto Expedition, timber industry, the War Between the States, African-American genealogy, colonial Natchez, and regional archaeological discoveries. Membership levels range from Friend ($25) to Benefactor ($1000). Dues are annual and the Preservation Society members act as the primary sponsors of educational programs offered by the SAHPS every year. All members will receive The Sentinel, the official newsletter of the SAHF. Click here for membership information. The purpose of the South Arkansas Historical Preservation Society, Inc. is to share the history of South Arkansas by collecting and preserving stories, genealogies, documents, artifacts from past generations and to promote the history of South Arkansas through events, printed material and new technologies.